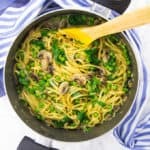 If you’re looking for easy weeknight recipes, this garlic mushroom one pot pasta is perfect for you! It’s vegan, super creamy, and ready in less than 25 minutes! 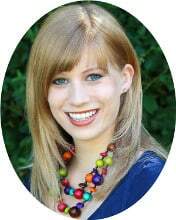 If you’ve been following my blog for a while, you probably know that I’m a huge fan of pasta. I mean I absolutely LOVE pasta!! 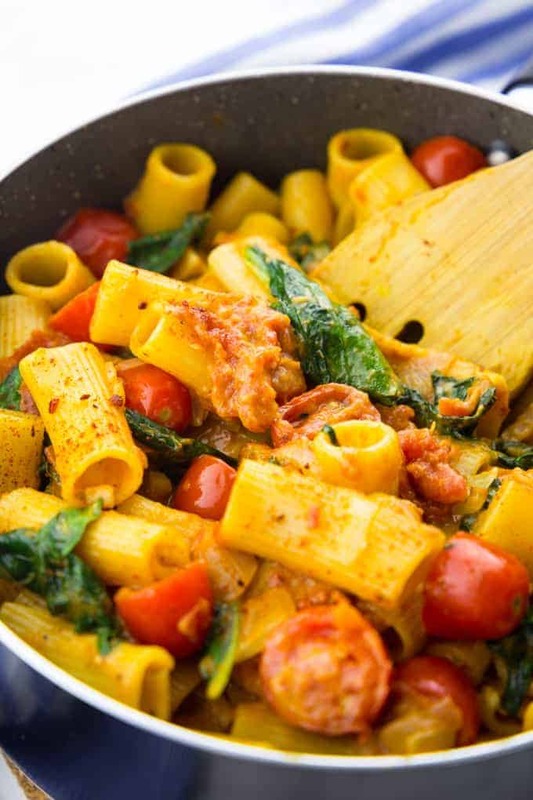 And I love quick and easy recipes, so one pot pasta is perfect for me. 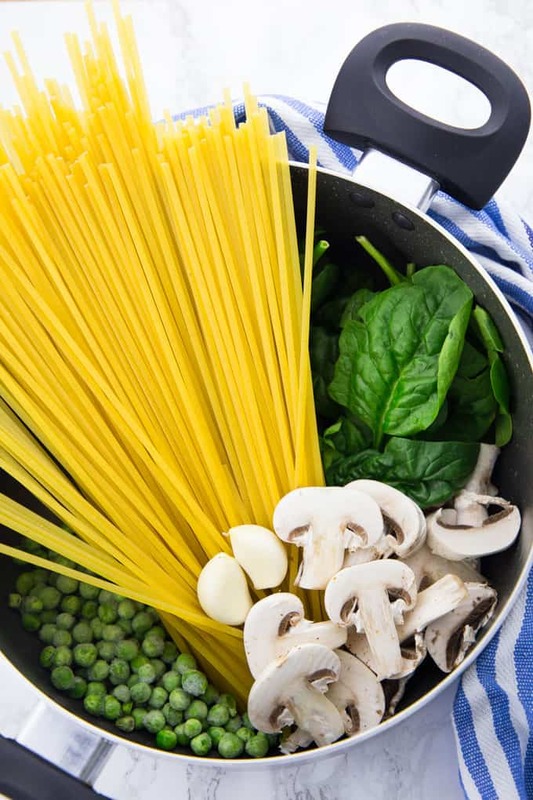 It’s such an easy way of cooking pasta. 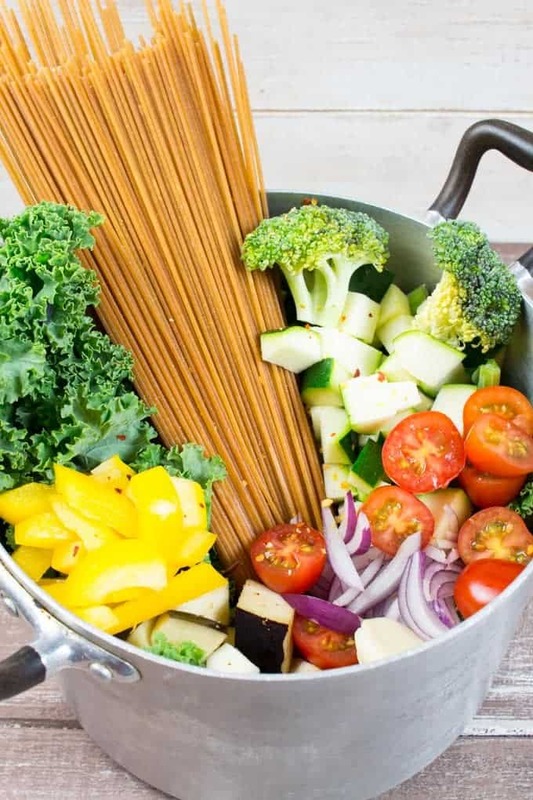 You just put everything in one pot, including the uncooked pasta. Unfortunately, we don’t have a dishwasher in our apartment, so having less dishes means less work for us. Haha! I hate doing dishes, so this really is a nice change once in a while. As you can probably imagine, being a food blogger without a dishwasher means you spend a lot of time cleaning up dirty dishes!! As always, you can find the full ingredient list and the recipe instructions in a separate recipe box at the end of this post. 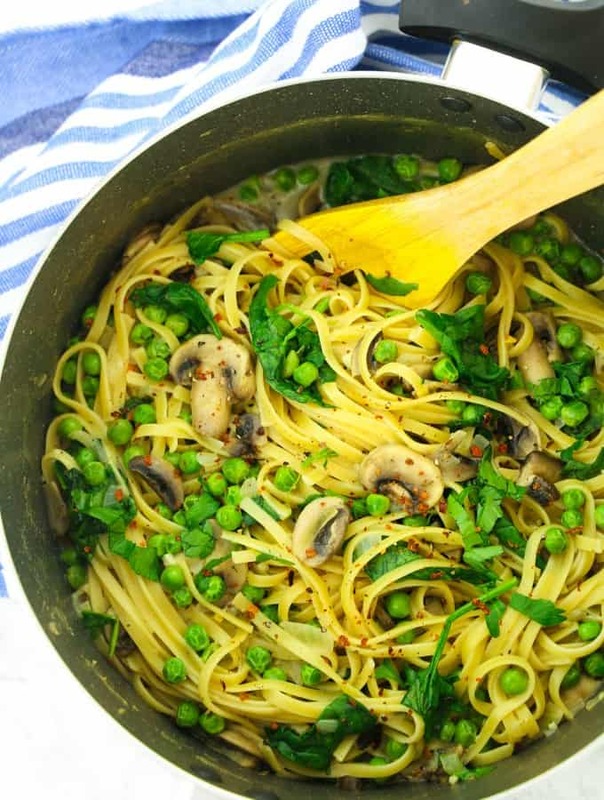 The ingredients you need for this vegan one pot pasta are pretty basic and you will likely find them in any grocery store. The only exception is the tapioca starch. I usually add it at the end of the cooking time and it makes the pasta super creamy. You can find it in well-stocked supermarkets. But if you can’t get hold of it, don’t worry! The garlic one pot pasta will still turn out fine, even without the tapioca starch. 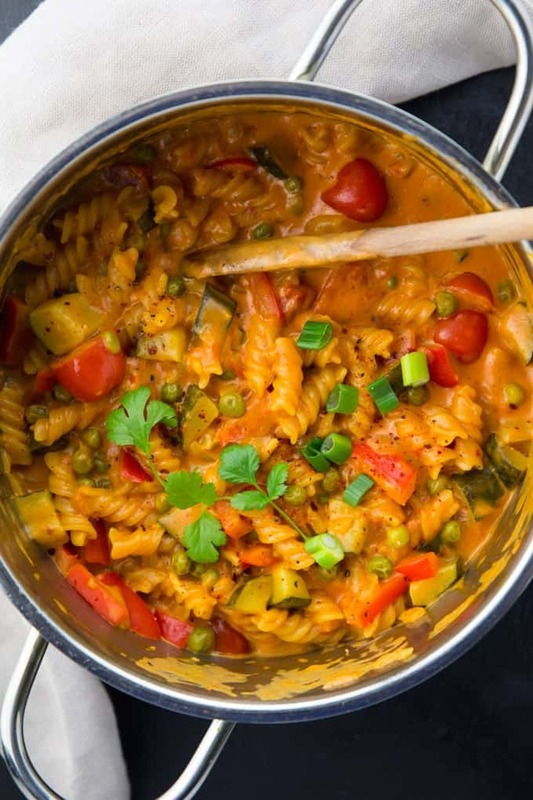 I hope you like this vegan one pot pasta as much as we do! 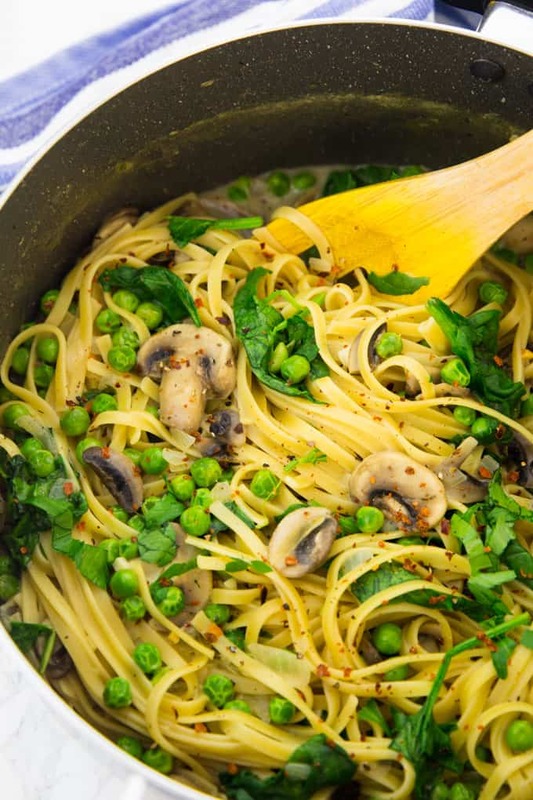 If you're looking for easy weeknight recipes, this garlic mushroom one pot pasta is perfect for you! It's vegan, super creamy, and ready in less than 25 minutes! In a large pot, heat some oil and sauté the onion for about 3 minutes. Then add the garlic and the mushrooms and cook everything for another 2-3 minutes on high heat. Add the uncooked fettuccine, the vegetable broth, and the almond milk. Stir a couple of times and gently push the fettuccine in the liquid when they're soft enough (this might take a couple of minutes. Try not to break them when they're still too hard). 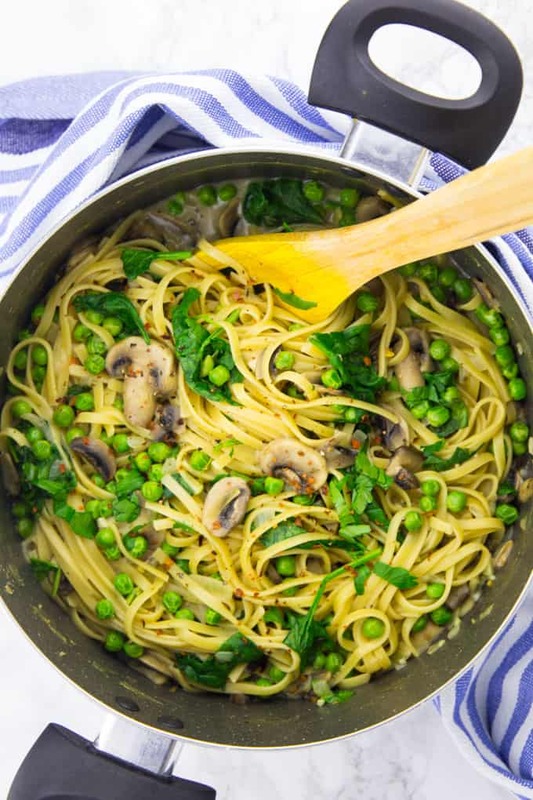 After 12 minutes of cooking, add the peas and cook the one pot pasta for another 8 minutes. Then stir in the spinach. If you're using tapioca starch, combine the starch with 1 tablespoon of water and whisk until well combined. Add to the pasta and season with salt, pepper, and if using red pepper flakes. Enjoy! You forgot to add the peas to the ingredients list. What is the measurement? Do they go in frozen? I made this last night and it was a big hit! I mixed my cornstarch with a little organic, vegan, white wine. Excellent!! Next time I plan to use “No chicken” chicken broth instead of the veggie – just to try something different. It made two very large servings with a cereal bowl size worth of leftovers for a side dish. Highly recommend! Thank you Sina! This recipe was so easy and delicious! Making this every week! So good! I’ve made this a few times now just subbing the veggies for what I have!